I decided over the weekend that I wanted to get back into creating fairy gardens. They’re so much fun to create. And fun for the kids too if you have children or grandchildren. This is my old enamel pan I found somewhere along the line. Typically in a fairy garden there will be a fairy of some variety. Oftentimes a gnome. And usually you will add small blooming flowering plants so it doesn’t overwhelm the miniature scene you’re attempting to create. I like to add picket fences, because who doesn’t love a picket fence? Or a bright red tricycle? Here’s the second one. It is themed with owls. You don’t have to have a theme. All these things I had on hand except for the plants, and I picked those up the other day. 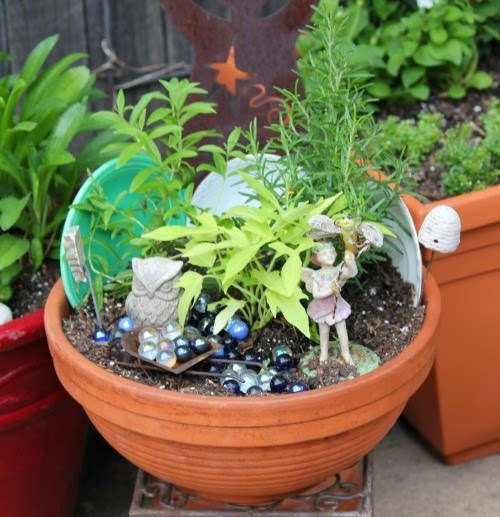 Four inch potted plants are perfect to plant in your fairy garden. It is important to choose plants that like the same amount of sun and water, etc. Here we have potato vine, an annual. And rosemary and lemon verbena. I love to add herbs to my fairy gardens. The glorious scent seem to add to the magic. Usually I will use an odd number of plants, like three. But in the fairy garden above, I’ve only used two sun lovers. Because I have a lot of seeds planted, and I can transfer something over here later. Where do you get miniatures for fairy gardens? Of course you can google fairy gardens and find most anything you want to order online. 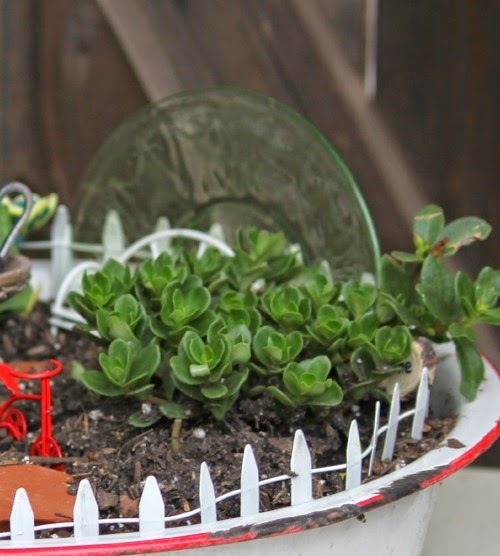 Or just pick little things up at the thrift store or garage sales that are durable to put outdoors. There are no rules. Just have fun. 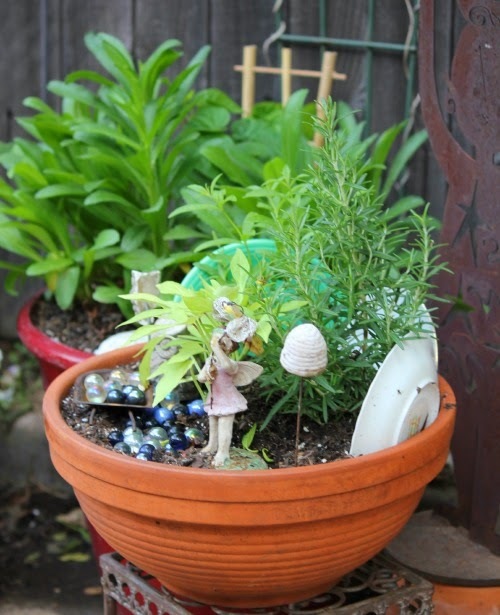 Children love to plant fairy gardens. And adults seem to share that excitement. So try this. I think you will be smitten. Anything that will hold dirt can contain your fairy garden. Sometimes the more unusual the better! I love fairy gardens, my granddaughter and I did one last year, I had to have a mushroom in mine. It is lovely- I have to wait on doing my container gardens until I return in middle June. Going on a trip for 2 weeks and I don't like to bother anyone to have to water. Hopefully I will get things on sale when I get back. In Texas I saw gardeners put clay water jugs in the ground. I think I am going to start my list of plants I want to set up, thinking of coleus, sweet potato plant and something else. I almost got some coleus the other day. But they seem to die on me. I always wondered where to get the stuff for fairy gardens. Think I will try one this year. I love yours. Your house pics are looking great. 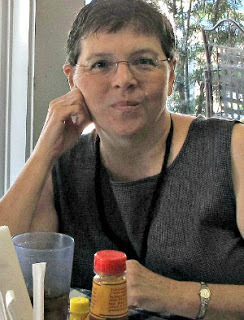 I forgot to say Happy Mother's Day Brenda…. Thank you, Valerie. I want you to know that every time I email you it comes back. They are fun to make and enjoy! Love them Brenda! You're the best at coming up with stuff! Yes, they are so fun. I love your adorable fairy gardens. The picket fence is a cute idea. It never occurred to me to have a theme! Thanks for the wonderful suggestion. A theme gets you unstuck when you can't think what to do! I had plans to make my first fairy garden this spring, but it will have to wait until I get back home in June. I've been searching for some cute things to add too it. Love your fairies, I haven't found the right one's yet…but I will. Love the plates making a backdrop. I will do that for sure. Fun post ! Oh Linda, I'll be glad when you can stay home awhile. You're missing out on so much this gardening season at your new home. 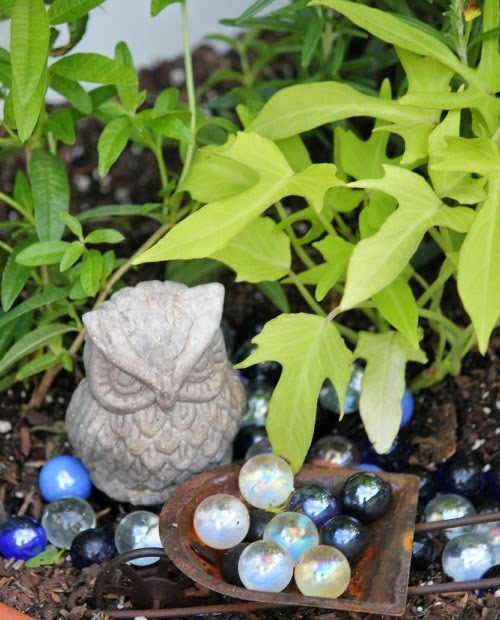 I have never made a fairy garden but I'm getting very tempted by all of your pictures. Stay safe sounds like a chance of bad storms in Okla. and here in Ks. Hope it rains anyway. This heat is dreadful. I have what would be an old Party Lite cabin on water candle holder I got years ago. Was going to give it away and thought, gee, it would make a great fairy garden base! It has a canoe in it. I just need a big enough planter to put it in! I also think the old David Winter houses would be great for fairy gardens. If we just sorta shop the house we can find things! ha ha. Your patio must be an amazing oasis already. I am so happy to hear you are enjoying it so much. The only way I would enjoy it more is if I had little paths of rock instead of just cement. But I am grateful for what I have and having a blast with it. You're welcome, and Happy Mothers Day to ya! 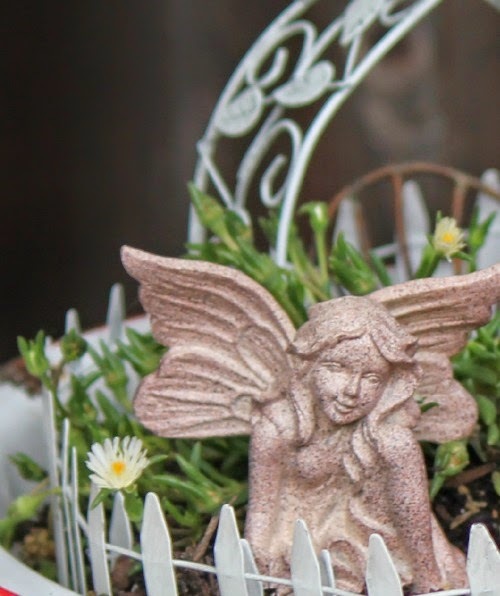 If you buy specifically for fairy gardens, just like with doll houses, they make them pricey. Just find this and that and put it together. My younger daughter emailed. I enjoyed that. I love them both Brenda…so cute!! Love how you added the plates to them! Well, when you have too many little plates, that's what you can do with them. That sure was my answer! 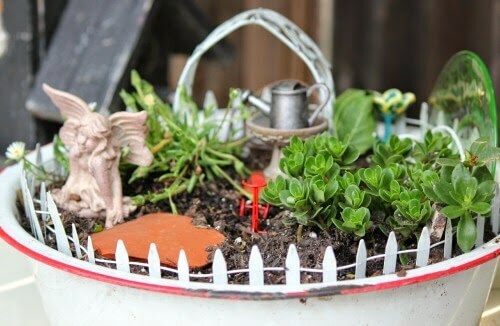 The fairy gardens are a great idea and lovely. 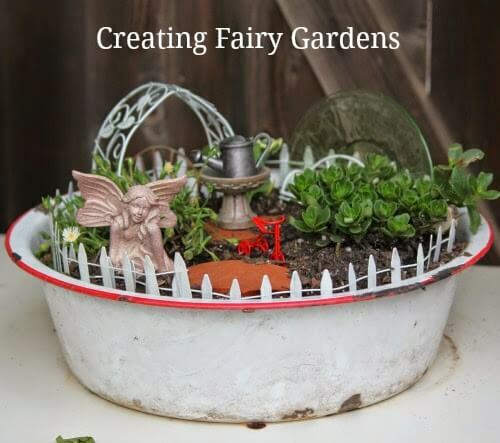 Your fairy gardens are adorable Brenda..I am soon ready to start on mine..I am also doing a gnome garden this year in a big old wheelbarrow..I would trade my huge backyard for your cozy little fenced in patio anytime..It looks so private and relaxing..Your new place is so nice!! 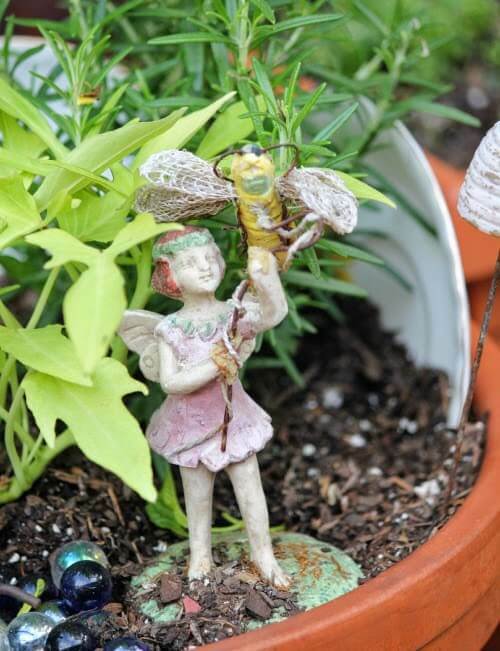 Love your fairy gardens – always have. Especially love the one in the old enameled bowl. So cute!! Oh I love love your fairy gardens! I bought a pan last year and never got it done. You make everything look easy because your so good at gardening!! I am gonna make one!! I hope you had a good day. Take care! I love the fairy gardens. They are so full of whimsy. I think we could all use a bit of whimsy in our lives. I am making a fairy garden this year. Only thing is I am making it for indoors. I am going to use artificial plants and moss. That way I can enjoy it all year. I can't wait to get mine started, but we have another 6" of snow on the ground right now. It will flip to warmer, spring weather here in a couple more weeks. Until then, I'll just enjoy your fairy gardens, Brenda! So cute! I know a little girl at my church who loves to make these.